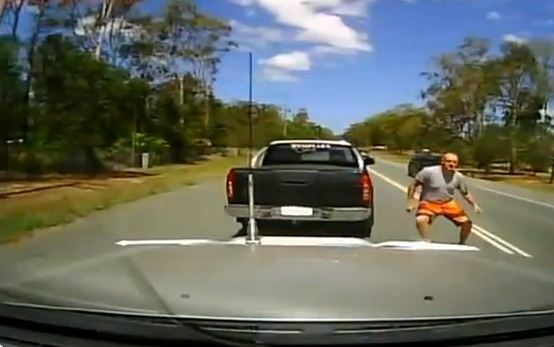 Road rage incident near Logan, south of Brisbane, captured on film. Images: Today Tonight. A 21-YEAR-OLD man allegedly involved in one of the worst road rage incidents captured on film in Australia has been charged by police. Police said on Thursday they had charged a man in relation to a traffic incident in Cornubia on December 15. Around 1.15pm, two vehicles travelling along Beenleigh-Redland Bay Road were involved in a number of incidents, culminating in a man exiting his vehicle and allegedly smashing the windscreen of another. A 21-year-old Carbrook man has been charged with one count each of wilful damage and dangerous operation of a motor vehicle. He is due to appear in the Beenleigh Magistrates Court on January 14. The drama, near Logan, was caught on film with a video mounted inside a car driven by former policeman Ken Olsen, who said he was the victim of an unprovoked attack. The footage, which aired on Today Tonight on Tuesday night, shows a man and a woman hurling abuse at him before trying to run his ute off the road. Road rage drama near Logan. Mr Olsen's is heard in a frantic call to police as the other vehicle crosses onto the road side of the road and even tries to pass him from the inside lane and then on the footpath. "He'd crashed into my vehicle so many times I was convinced it was going to stop going, and I thought once my vehicle is not going, I have no protection, this bloke is going to kill me," Mr Olsen said. "I had to go on to the footpath, I got onto footpath and went over traffic islands with him in pursuit. "I got around a traffic island, then he crunched into the side of me so I had to go onto another footpath to get away from him," he said. In the scariest moment, the road rage driver hurls himself onto Mr Olsen's car and then punches his windscreen. Mr Olsen tells police during the 000 call that the man has fallen to the ground. He is advised to drive straight to the Logan Central police station and not to go back to the scene. Police are appealing for the driver of the black ute involved in the attack to come forward, saying investigators wanted to hear both sides of the story. The drama appeared to begin when Mr Olsen merged into traffic and applied his brakes, causing the other vehicle to run into the back of him. Meanwhile, a man who police caught driving by torchlight at Goolmangar allegedly told officers he had just driven from Nimbin after getting 'stoned'. At about 3.10am on Saturday police received a call about a vehicle travelling dangerously along Nimbin Rd at Goolmangar. The witness told police that the vehicle was travelling without headlights or tail lights and the driver was holding a torch out the window to light up the road. Police said the witness reported seeing the vehicle cross the double lines on numerous occasions.